ALL DETAILS INCLUDING PICTORIALS AS ADVERTISED IN SWTC’s WEBSITE AND RELEVANT ARE BELIEVED TO BE CORRECT IN GOOD FAITH AT THE TIME OF ADVERTISING.VESSELS AND/OR ITEMS OFFERED ARE AS PER “AS IS WHERE IS BASIS” SUBJECT TO PRIOR SALE,PRICE CHANGE OR WITHDRAWAL WITHOUT NOTICE.SHER WORLDWIDE TRADING & CONSULTANCY (SWTC) SHALL NOT BE LIABLE FOR ANY WHATSOEVER ERRORS,OMISSIONS OR MISPRINTS.SWTC RESERVES THE RIGHTS TO AMEND THE ADVERTISED CONTENTS. THANK YOU FOR YOUR SUPPORT AND COOPERATION IN ADVANCE. 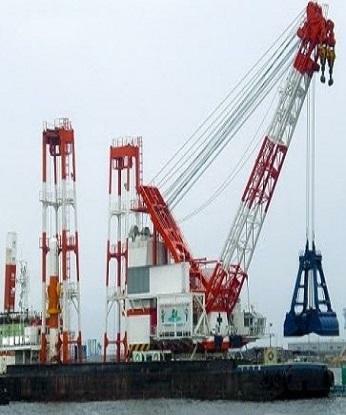 30 m3 GRAB DREDGER FOR SALE..
80 T GRAB DREDGER (M/V TBN) FOR SALE..
DREDGER FOR SALE ~ 4,824 TDW ~ BUILT 197..
20M3 GRAB DREDGER FOR SALE ~BLT 1985 ~ ..
30 CBM GRAB DREDGER / CRANE BARGE / PILI.. NON PROPELLED SUCTION CUTTER DREDGER FOR..
GREETINGS,please go through every detail of this website as per your interest and revert with your esteemed enquiries and we hope to have a mutual understanding & cooperation with a WIN WIN result for all like minded INDIVIDUALS or COMPANIES.IMPORTANT INFORMATION :-Vessels as advertised in SWTC Website are not exhaustive,therefore serious enquiries of other vessel makes either on S&P or Charter,we welcome your esteemed enquiries. THANK YOU. ALL IRRELEVANT MESSAGES AND SCAMS WILL BE REPORTED TO THE INTERNATIONAL SCAM WATCH ASSOCIATION FOR FURTHER ACTION.THEREFORE ALL POTENTIAL ENQUIRIES SHALL BE GENUINE BUSINESS RELATED AS PER SWTC WEBSITE AND RELEVANT. UPON ANY DUBIOUS TELEPHONE CALLS,UNVERIFIED WHATS APP MESSAGES/PHOTOS,E MAILS,VIA SOCIAL MEDIA AND / OR RELEVANT RECEIVED FROM ANYONE,WE SHALL REVERT TO OUR APPOINTED ADVOCATE & SOLICITOR TO DEAL WITH THE SITUATION WITH APPROPRIATE ACTION TAKEN.THEREFORE,STRICTLY VERIFY THE CONTENT OF YOUR INFORMATION BEFORE COMMUNICATING WITH SWTC. OFFICIAL NOTIFICATION - DO NOT USE OUR COMPANY NAME SHER WORLDWIDE TRADING & CONSULTANCY (SWTC) WITHOUT THE APPROVAL FROM OUR ATTORNEY.IN THE EVENT IF USED AND ANY UNTOWARD INCIDENT,THEN YOU HAVE TO BE RESPONSIBLE FOR IT.PLS BE NOTED.THE COMPANY NAME SHER WORLDWIDE TRADING & CONSULTANCY (SWTC) IS BEING MONITORED BY SWTC APPOINTED ADVOCATE & SOLICITOR AND IS EXCLUSIVE ONLY TO SHER.DO BE NOTED THAT WE ARE NOT AFFILIATED TO ANY PARTY WHATSOEVER LOCALLY OR ABROAD.THANK YOU.